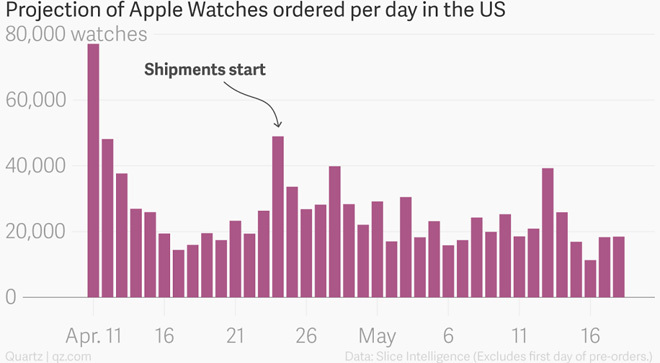 Over 1 million Apple Watches were sold on launch day, Slice Intelligence analysts put the number at almost 1.5 million. A solid start, but then something strange happened – demand all but disappeared. These projections are for the US and are based on info from over 14,000 online shoppers and cover the period from April 10 to May 18. Most of the action happened on the first day, since then the total has sauntered to just 2.5 million. 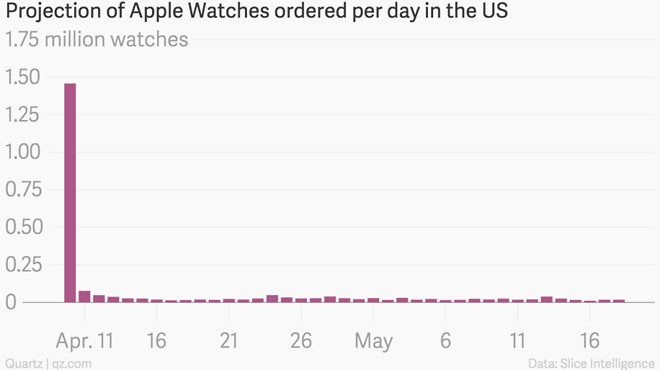 US owners started receiving their Apple Watches on April 24 and you can see on the chart above there’s the tiniest upticks as those early adopters posted their feelings on the Watch. Now look at the chart below, which shows early predictions. To be fair, there’s no confirmation on Slice’s numbers yet. Also, the Pebble took a lot longer to reach 1 million sales, Android Wear only managed 720,000 in 2014.